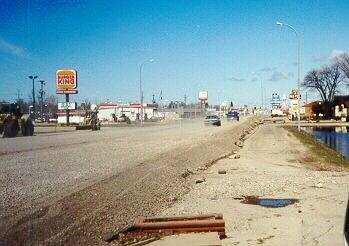 The photos on this and the following page were taken by Grand Forks resident Mike Kuchar late in April 1997, when residents began returning to the city. 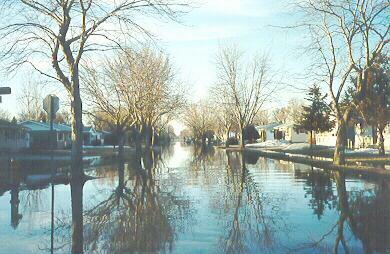 Fifteenth Street still looked like a river a week after floodwaters entered the city. There were still snowbanks in the yards. 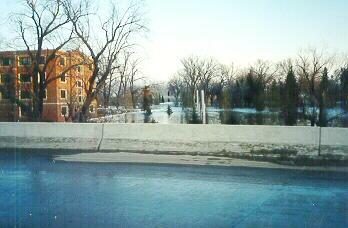 There was still a lot of water east of Washington on 14th Ave. a week later. 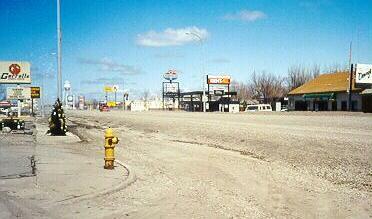 The city built a dike on South Washington in an attempt to protect the southwest part of the city from flooding. Another view of the South Washington dike. University Ave. at the English Coulee on the University of North Dakota campus. Only a submarine could use the Washington Ave. railroad undeprass. 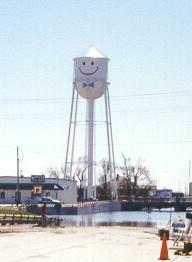 And what is the water tower smiling about?